Background: The rate of human immunodeficiency virus type 1 (HIV-1) infection in Iran has increased dramatically in the past few years. HIV-1 genome sequences are pivotal for large-scale studies of inter- and intra-host evolution. To understand the molecular difference between reference HIV-1 isolate and two HIV-1 infected patients in Iran, we conducted this study to analyze some genome segments of Iranian HIV-1 isolates. Methods: Two HIV-1-infected individuals who were under antiretroviral therapy (ARV) for 8 years with stable clinical status were enrolled. The patient’s plasma samples were used for the Gag-Pol genome sequences (4500 nt). The phylogenetic tree and similarity plotty were obtained based on Gag-Pol sequences. Results: Both HIV-1-infected isolates belonged to CRF35_AD subtype even though one of them had drug resistance. The HIV genome and protein sequences showed no clear difference between genome and protein sequences of our samples and the reference sequence. Conclusions: Our patient’s stable clinical status had no connection to genome sequence; which could be owing to immunological factors or other patient’s mode which are still unknown. Keywords: HIV-1, protein sequences, immunological factors, patient’s mode, reference sequence, stable status. Keywords:HIV-1, protein sequences, immunological factors, patient’s mode, reference sequence, stable status. Abstract:Background: The rate of human immunodeficiency virus type 1 (HIV-1) infection in Iran has increased dramatically in the past few years. HIV-1 genome sequences are pivotal for large-scale studies of inter- and intra-host evolution. 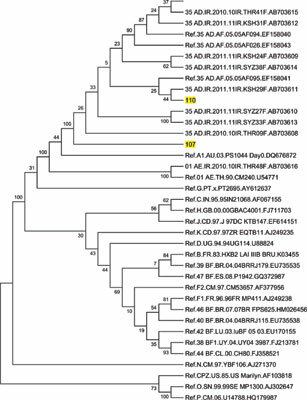 To understand the molecular difference between reference HIV-1 isolate and two HIV-1 infected patients in Iran, we conducted this study to analyze some genome segments of Iranian HIV-1 isolates.